I have used every version of Pages since it was released by Apple. The iWork 09 version worked perfectly, but at that time, it cost $79.00 for the suite of Pages, Numbers and Keynote. Later, in 2014, Apple released a new version. The pricing dropped to $19.99 for each app on a Mac, and $9.99 for an iOS device. At the same time, the version of iWork for iCloud became available. However, you could get the apps for free when you bought a new Mac computer. Then in 2017, Apple finally made all three apps free on the Mac App Store for Mac, iPad and iPhone. While I have never found a lot of use for Pages for an iOS device, it can be handy for a quick edit or writing when travelling. But I have used Pages documents and Numbers for Mac almost every day now for well over ten years on my Apple laptops. The best feature is that because the apps are designed for Mac, they work fast and integrate with all your other Apple tools. What about Microsoft Office for Mac? Great, but what about working with Word files with Pages? Are there any real drawbacks? Yes, I use Pages and Word for Mac too. The current version of Office I have installed is Office for Mac 2011 which works with versions up to Mac OS Sierra. But this version is not supported on Macs using MacOS High Sierra, Mojave or new versions to come. If you want to use Word or other Office apps on a new MacBook Pro, it is going to cost quite a lot of money to upgrade to Office 2016 or Office 2019. I have Word on three Macs. The price to upgrade is very expensive depending on which versions of Word you select. For a one-time purchase of the software for PC or Mac, it will cost over $350.00. For a yearly Office 365 subscription, it will cost me 3 cents short of $180.00. 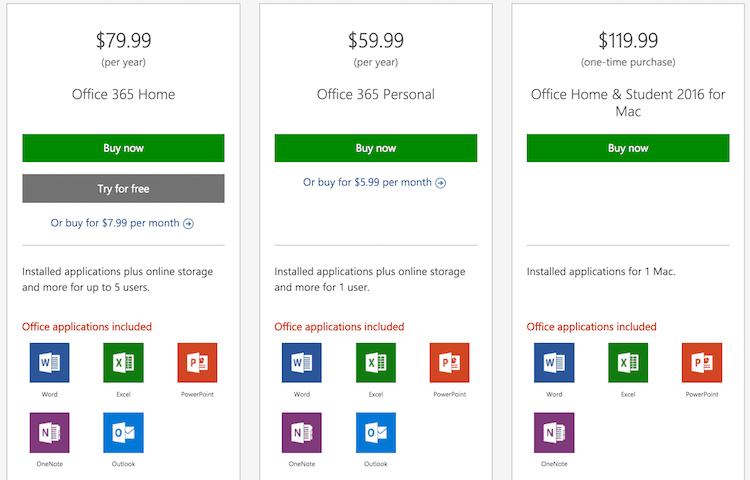 The price depends on which country you are in and which version of Office 365 you can choose. On top of that, of all the Office products, I would only use Word and perhaps Excel from time to time and never use the other apps in the suite. If you don’t need all versions of Word, Excel, Powerpoint, Outlook and OneNote, why pay for what you will rarely or never use? So given a choice between $350.00, $180.00 or free, it’s a no-brainer to consider using only the Apple iWork suite to replace the Microsoft Office suite. If you are a Mac user like me and your primary requirement is word processing, can Pages reliably replace Microsoft Word? The short answer is yes. Apple Pages is like having Word for Mac for free. If all you need is a word processor, Mac Pages can handle everything you probably need to do. In fact, it is difficult to think of a common function in Word that is not available in Pages documents. However, there are some areas of compatibility. They are particularly in advanced features of Word compared to Pages and Excel compared to Numbers. Most issues are related to the compatibility of macros that you might need to consider if you are an advanced user. Apple has a list of compatibility issues between Office and iWork apps. 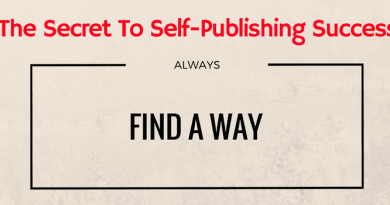 But unless you are using complex charts, tables and macros, there are really no aspects that would concern an author, content writer or blogger. It is a word processor, and it has had a lot of stability improvements over the years to make is extremely reliable and robust. After half an hour or so of becoming familiar with the menus, options and text styles, you will find that Pages is very easy to use. The sidebar menu is intuitive and changes depending on what you are doing or where your cursor is placed. For most users, every tool you need is visible when you need it. One huge plus with working with Pages is that you never need to bother with doing a save, as it saves automatically. Every day tasks like inserting headers and footers, text boxes or adding page numbers are all simple. The image galleries make adding and adjusting images quick and easy. This is one area where Pages really shines. There is a lot more control over images compared to Word. You can scan a document using an iPad app and then drop your photo or scan into a document. Equally as easy, you can add an existing image from your hard drive. For authors working with paperback covers, it is very easy to drop in a high-resolution cover image, make your adjustments, and then export directly to pdf. One minor image feature that is missing in Pages compared to Word is adding a hyperlink to an image. You would probably rarely need to do this. However, if you do, there is this workaround on Apple Discussions that works by overlaying a text box and then making it invisible. 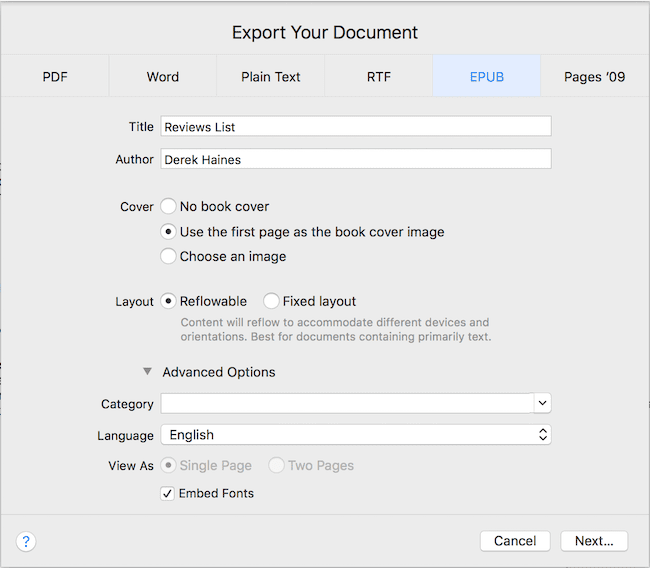 One other big plus for Pages for authors is that you can export to directly epub without the hassle of converting your file in another program. 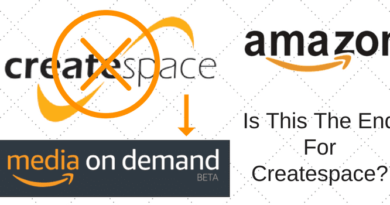 If you are publishing ebooks, this is a huge time saver. While there are not a lot of options compared to what you get with Calibre, it is enough to export a perfectly acceptable epub file directly from Pages ready for publishing. There is no doubt that you will have times when you need to work with Word users. But it is quick and easy to convert Pages to Word, or Word to Pages. However, it would be rare that authors and writers need any real-time collaboration tools. Generally, the real need is to open Word documents or to send Pages documents in doc or docx file format. To open a Word file, simply open it with a double click or right click open file as you usually would do. If you do not have Word installed on your computer, it will open automatically in Pages. When you need to send a Word file, you can do a quick export. You can choose either .doc or .docx file format, then save your document and you can send it to a Word user. If you want to move away from the expense of Microsoft Word for Mac, you have two logical choices. You could opt for Google Docs, which is also free. However, it requires an Internet connection and only works in a web browser. Pages is a much a better option for Mac users because it autosaves directly to your computer hard drive, or more likely to you iCloud drive when you are online. On top of that, you get the full suite of tools for free, so you get Pages along with the other iWork apps, Numbers and Keynote as a bonus. As a Mac user, all you need is your Apple ID to download Pages Mac and iOS from the App Store. If you are creating documents and want to work on the move, you can use Pages on your iPhone or iPad. It can also use Apple Pencil, which is a cool tool for adding notations. Currently, you might be working with Word and Pages side by side. But when it comes time to spend a lot of money to upgrade your Microsoft Office version, it might be time to consider using Pages only. If you are a Grammarly user, there is no support for Word for Mac anyway. But to use the Grammarly editor, you will need to export to docx from Pages before you open your document in Grammarly. The same goes for using ProWritingAid as it too only accepts docx files. If you are exchanging document versions with a proofreader or editor who is using Word, again, you will need to export and import. But if you can live with these few and very minor inconveniences, then yes, you can certainly write and survive quite happily with only Pages as your main word processor. Plus, you will save yourself an awful lot of money by doing so. As matters stand Since October It will not cost you USD 180 to download three copies of MS Office, but USD 60, to down load to an unlimited number of devices (5 signed in at anyone time) and for that you also get 1TB of clould storage, whereas for Apple to get that storage you have to buy a 2GB package at USD 9.99 per month or a tad under USD 120 pa.
For USD 100 a month one can buy subscriptions for 6 users who each get office on an unlimited number of devices with the concurrent sign-in in limit of 5 per user and with 1TB each. I have to update my Microsoft 2011 for Mac. The reviews for Microsoft Office 2016 for Mac are pretty bad. I am considering getting Apple Pages. I have many Word documents (30 years of genealogy research). 1). Would I need to convert all my Word documents to Pages? 2). Can Word documents be switched easily to Pages documents? 3). I have macOS Mojave. Will my Word documents written with Microsoft Word 2011 become unuseable? Hi Lorraine. Okay, here are my answers. 1. No, you don’t need to convert all your files. Only when you want to use them. Open in Pages and then save. 2. Yes. Just open in Pages and your files will work. 3. I doubt Word for Mac 2011 will work with Majove, but you can try. I’ve found a few annoyances with Pages. 1. Word Count. The biggest is that Word Count only gives you the total words, including footnotes (no way to exclude that) and you can’t tell where you are in the doc–so if you have dumped a pile of notes in the file and are writing through from the top, you can’t tell how many words you’ve written–only how many total words are in the file. This is a big annoyance if you’re writing to length. 2. Also, spellcheck is primitive on Pages. You hit command and semi-colon and then a misspelled word is highlighted. You have to right-click on it and scroll down to change. With you you don’t need to fiddle with the mouse or track pad–it gives you a pop-up window and you can hit “enter” to accept a change right off the bat. I might not be explaining this well, but it’s definitely way slower with Pages. These might not matter to you, but they’re annoying and slow things down. I always use right-click for the spell checker and it works fine for me. And the word count? I must admit that I always have it turned off. I don’t like the little pop-up window it is in as it is quite distracting. Thanks, actually I had another look at it and I found that the spellcheck can run as a pop-out window so that solves that problem. On word count, I guess I can get around pages’ limited options by just defining what I want to count and not defining the footnotes. One other very annoying problem: when I finish a paragraph I hit the period key to end the sentence, and then hit enter. The cursor, as it should, goes to the next line and indents. Then I start typing the first sentence of the new paragraph. but, strangely, the first word is not capitalized. After a period between sentences in the same paragraph, the new word is autocapitalized, but not after I hit enter and start a new paragraph. Do you have that problem too? It’s really annoying.